E Pluribus Unum: "Out of many, one." This motto is emblazoned on the Great Seal of the United States, but it could be the church's model, too. Unfortunately, the daily experience of many Christians and churches feels like the opposite: out of one, many. We are increasingly aware of what makes us different from others, and it is hurting the church and its witness. All Together Different will help readers understand why we find it so difficult "to just get along." Drawing on research into personal and group identity, it equips readers navigate a culture that often pays lip service to the value of diversity but struggles to foster constructive dialogue and mutual respect. With clear writing and real-life stories, All Together Different translates social identity theory for pastors, church leaders, and ministry practitioners, exposing it to the light of biblical and theological reflection. 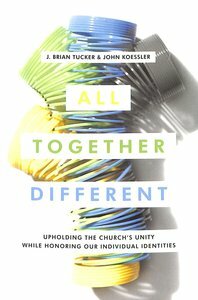 About "All Together Different: Upholding the Church's Unity While Honoring Our Individual Identities"